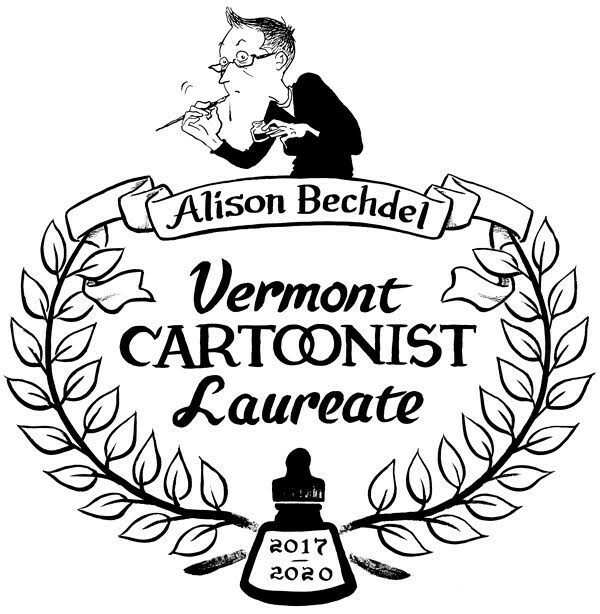 Next Thursday, April 6, Edward Koren will pass the torch — er, laurels — to his successor, Alison Bechdel, as Vermont Cartoonist Laureate. In a ceremony at the Statehouse, the longtime Bolton resident, creator of the strip "Dykes to Watch Out For," and author of Fun Home: A Family Tragicomic will become the third cartoonist laureate in the only state to regularly appoint one. The initiative originated with the Center for Cartoon Studies in White River Junction, the professional school founded by James Sturm and Michelle Ollie 10 years ago. Bechdel succeeds New Yorker cartoonist and Brookfield resident Koren, who in turn succeeded Vermont's very first cartoonist laureate, James Kochalka of Burlington. "It seemed obvious she could have been the choice from the get-go — we're lucky to have so many great cartoonists in the state," says Sturm of selecting Bechdel. "Besides all her accolades and fame, she's really a cartoonist's cartoonist. Cartooning is just essential to who she is and how she makes sense of the world." Bechdel's "Dykes" was widely syndicated (including in Seven Days) for 25 years, and she has drawn a few new ones in recent months to let her characters comment on current political events. In 2006 she published the graphic memoir that became a bestseller and award winner. Later, it was adapted into a musical by playwright Lisa Kron and composer Jeanine Tesori. Fun Home first opened at the Public Theater in New York City, and then moved to Broadway in 2015. It captured five Tony Awards including Best Musical. Theatrical success was not the only unexpected honor for Bechdel in recent years. She won a Guggenheim Fellowship in 2012, and two years later was named a MacArthur Fellow. But her fans back in Vermont always knew Bechdel was a genius. Even Vermont's congressional delegation has applauded the selection of Bechdel for cartoonist laureate. In a joint statement they noted, "For three decades, Ms Bechdel's talents have been well known to Vermonters, and we have proudly watched her achieve the national acclaim she deserves. Her scope of work — from books to Broadway — has added to our national discourse." Bechdel will be recognized at the Statehouse next Thursday, April 6, at 1 p.m. followed by a photo-op with Gov. Phil Scott at 2 p.m. A presentation of laurels with Bechdel will take place at 4 p.m. at CCS, 46 South Main Street in White River Junction. The event is open to the public but seating is limited. Seats can be reserved here.